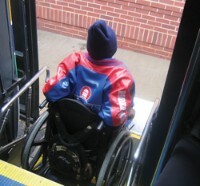 In February, of 2011 The Kennedy Center, Inc. received a grant from the Federal New Freedoms program to conduct a Mobility Management Project. This project aims to: coordinate all transportation options for people with disabilities, seniors and veterans in Southwest CT; identify gaps in service; and help implement new service where it is most needed. Essentially, we are creating a “one-stop shop” where individuals can find solutions to their transportation challenges. Please contact The Kennedy Center at 203.332.4535, ext. 2310 or email if you would like us to come and give a presentation on transportation options or run a focus group on transportation gaps at your agency.